We have seen the future of hard disks and it is removable. In fact, we're using removable hard disks so much now at Gadgets by Small that our considerable "other" hard-disk collection is pining away from loneliness. 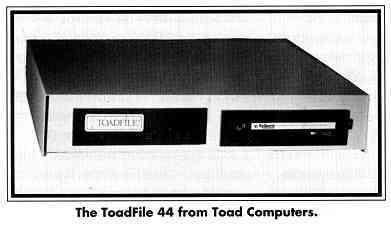 All three removable hard disks reviewed here - the Toadfile 44, Carter Graphic's SQ-44 and Atari's MegaFile 44-are very much alike. They each use the same basic hard disk (Syquest 44), the same media and they use it the same way so that you can interchange the hard disks between them. Choosing one of the three is mainly a matter of picking what case and label you want. Each of the three drives we looked at is a 44MB removable hard disk for the ST. Each one connects through the ST's DMA port, and can be "daisy-chained" with other DMA equipment, such as the SLM-804 laser printer, other hard disks, CD-ROM players, etc. The drives' technology is based on the Syquest 44MB removable cartridge. In other words, the actual "platter," the place on the hard disk where data is stored, is portable between Syquest drives. The platter itself is protected by a very tough clear-plastic case. Thus, unlike hard disks, where the platter is hermetically sealed inside metal, the Syquest drive lets you change platters. The immediate things that come to mind are that you can access another 44MB of data as fast as you can change platters, and that the disk packs are very portable, so it's easy to carry around a lot of data. And all that data can be accessed very quickly; I have no problem recommending the Syquest as your primary hard disk. Changing to another 44MB disk pack is about a one-minute operation, very much like changing a compact disk. Push a button, wait until the disk spins down, flip the EJECT/LOAD lever to remove it; plug in a new disk, flip the EJECT/LOAD lever back, and let it spin up. Wait a few seconds, it's ready. Hence, you can have as much storage as you want just by purchasing more 44MB disk packs (which cost around $100 apiece). If you've priced 40MB hard disks - especially, fast 40MB hard disks (ST 251-1 type stuff), you can guess that a Syquest drive would be the economical choice. The Syquest drives are also unbelievably fast. I do a lot of work on the ST, and have spent quite some effort to get the fastest possible hard-disk mechanisms because I can't afford to wait on slow ones. Well, the Syquest keeps up with the fastest I've got (Mitsubishi 60MB RLL drive/ OMTI 3527 controller at 1:1) with no effort at all. Gadgets by Small now does all of its development work for Spectre GCR, HyperWeb (tm), etc. on the Syquest drives. Sandy uses the Syquest on her Mac II. Doug carries his back and forth between his house computer and work computer. You see, 44MB is enough space to store several major projects on; you can literally carry around your whole computing work with you. We're hooked! And we're not alone. If you ever get to Atari's R&D lab, you'll see the employees carry around Syquests. At COMDEX this year, a minor fix was needed for a demo, and Atari asked to borrow the Megafile 44 (which they'd loaned me) to fix a file on a Syquest. We were very happy to demonstrate Spectre at COMDEX on a Syquest because of its impressive speed. All I can say is, why didn't someone tell me about these drives earlier?! I had no idea what I was missing. The Toadfile case is pretty big; it has room for another drive internally, which could be just the ticket if you plan to expand later. (Adding the drive would be a matter of extending the SCSI cable inside - a few hour's easy work at most). The Carter Graphics case we saw is light, compact and very portable, about the size of a half-height hard disk and power supply; if you need to lug around a disk drive, this is ideal. It would easily fit in a briefcase. Carter Graphics also offers other cases, such as one much like the Toadfile case. I like them both; it just depends on what your particular needs are. The prices are exactly the same. 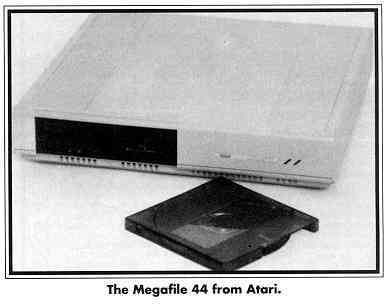 I've not opened up Atari's Megafile-44, so I don't know its internals. (The unit I used at COMDEX had serial #40, so they're pretty new!) The case is much like a Megafile-30 case, with a hole cut in it for the hard disk to go through. I would guess Atari is using their standard ACSI-SCSI interface boards and power supplies. I have no idea why Atari, which can build things less expensively than anyone else, is charging more than its competition for this drive. Carter Graphics and Toad Computers supply ICD's formatting software, which I have nothing but good things to say about. ICD (and Supra) are some of the unsung heroes in the world of Atari machines and the formatter is no exception. It couldn't be easier to use. Atari, as usual, supplies their HDX software; you'll want HDX 3.01 (or later) to handle these drives, as special software is needed to handle changing hard disks in mid-session. Personally, I used ICD's software, as it's necessary for use with ICD's tape backup unit, which I also use. I would be amazed if you have to read the manual to plug these units in because it's so easy. (However, it's a good idea to read it to learn about handling the disk packs and about media change). If you don't have something plugged into your DMA port. like a hard disk or SLM804, plug the supplied cable between your ST and the drive. If you do, still plug the cable between the ST and the drive, and plug whatever else you have into the second connector of the unit. Next, plug in the power cable. Essentially, if you've ever connected a hard disk to to an ST, you know how to set up the Syquest units. If you're a power user with lots of hard disks, you'll have to make sure the Syquest drive doesn't conflict with another drive (you can't have both drives saying they're the same SCSI drive number, a bit like having two A: floppies). I had to do this and it took me easily under five minutes, screwdriver and all. Well, you're set. Start using it as you would any other hard disk. Set it to AUTOBOOT, put around 60 double-sided floppy disks of data on it and have fun. The front panel controls on the Syquest drive are a button and an EJECT/LOAD lever plus some indicator lights. To put a disk pack into the Syquest, just slide it in and flip the lever all the way to the left (LOAD). A light will flash as the Syquest spins up to operating speed (3200 RPM). When it's spun up, which takes just a few seconds, the light will show green and you're ready. To remove a disk, press the EJECT/LOAD button. The disk will spin down, again with a flashing light to warn you it's not ready yet. When the light stops flashing, push the lever far to the right (EJECT); the disk will eject, and if you're not careful, shoot into your lap. Whoever makes these drives uses good springs! middle of an ST session, you must be just a tad careful. You see, hard disks by their (past) nature are not removeable, so no one designed the ST's operating system to handle them being changed while the ST is on. I've tried to deal with this, found how many problems there were and my solution was to force the ST to cold-reset when the hard disk fundamentally changed (by, for instance, restoring a backup from Meg-a-Minute). Of course, a challenge like this is like waving a red flag at ICD, who promptly taught the ST's operating system about "media change." What it boils down to is when the drive's disk pack is changed, the next time the ST accesses the drive, the very first access returns a special code indicating the change. The ICD hard disk software then tells the ST that the hard disk has changed. I have no idea how. I've dug into the ST's operating system at length, and this is no trivial thing to do; yet ICD makes it look easy. A message flashes in the upper right-hand corner of the screen, saying "DISK CHANGE" -and you're on your way. Really, it's very much like changing a floppy. For instance, if you're at the desktop, you must press [Esc] to get the desktop to show the new floppy's contents. The amazing thing is that ICD covered such difficult changes to the ST's operating system with such an easy, foolproof interface. A few of our 4-a.m. programming sessions will test the idiot proofing of any system, and we have yet to screw up a Syquest. I should briefly mention that Magic Sac, Spectre and pc-ditto are fully compatible with this unit. However, as yet Spectre software does not support changing disks in the middle of a Mac session, unless the partition layout is identical between disks. Also, Syquest disks formatted on a Mac can be plugged straight into a Spectre/Syquest setup and used, when formatted correctly. The Syquest people have battled the problem of removable hard-disk media for a long time and appear to have won, judging from what I've seen. They can't just seal up the platter and head like other manufacturers do; the nature of their unit means that the drive is going to be exposed to a lot of gunk and the heads can't spend their life in a clean-room environment. As I understand it, the Syquest people's solution was to purge the hard-disk area with a blast of high pressure air and clean all the dust off the platter, in addition to lots of technology in the hard disk head to not be damaged by any residual dust. The manuals do recommend that you store the hard-disk packs in a snap-in plastic case, very much like a snap-in coin collector's case, rather than leaving them out and spilling pizza and Pepsi on them (typical programming office conditions). After a few months, I was casually tossing the Syquest disks on the shelf, treating them like I do floppies. I never once experienced an error the entire time. You may wonder if the drive-to-drive alignment is good - can a disk made on one drive really go into another? Given the extremely close tolerances of hard disks, this is a good question. We have four active Syquests in our office - two on STs, one on a Mac II, plus one on Doug's ST at home - and freely interchange them. In months of use, we have never had a disk error. This speaks well of the Syquest internal mechanism's long-term toughness; it doesn't fall out of alignment easily. It is really refreshing to use something as trouble-free as the Syquest. To this day, Syquest is fighting the old legends of how fragile hard disks are, and how "unreliable" removable media is, because it's "contaminated by outside air". Well, floppies used to be pretty unreliable, too, back in 1979- but that's all changed. Such is the case with removable hard disks. All three drives are compatible with Partcopy from the April 1989 issue of START. This program is a very high-speed hard-disk sector mover; it can be used to very rapidly copy a hard-disk partition anywhere. It runs at around 8-10MB per minute. Rather than bothering with copying files one at a time, it simply copies an entire block of sectors at a time, doing an "image" transfer. Partcopy is among the nicest ways to do a backup of a hard disk, because it's very fast; even the largest of hard disks will be finished very quickly at 8MB/minute. Even though I wrote it, I have to recommend it to you for backups or for moving around large partitions, as GEM takes all day to do the same thing. 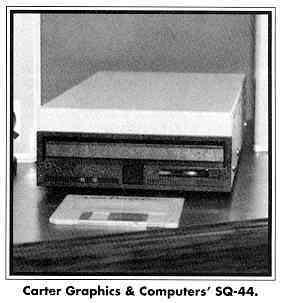 Carter Graphics supplies Partcopy, according to their ad, with the system. You'll notice that the Syquest keeps up with very fast drives (20 millisecond RLL drives) during Partcopy. The drive is said to have a 25-millisecond seek time, and a 600K per second transfer rate; I can well believe it. We now use the Syquests as the primary development drives and we simply wouldn't if other, "fixed" hard disks we have were any faster. Note that the common RATEHD hard disk benchmark program does not return results consistent with reality on the Syquest. I know from Partcopy that the Syquest is even or ahead of the Mitsubishi RLL setup, yet RATEHD returns a 20-millisecond seek rate on the Mitsubishi and a 45-millisecond seek rate on the Syquest. Don't believe it; something in the benchmarker is wrong. I really wish I could come up with something bad to say about these units, because then it would make this review look more balanced. The price is a bit higher than other 40MB units, if you really do your shopping, but that rapidly turns around when you start buying a few 44MB disk packs at around S100 apiece. The drives are rugged past the point of belief. I encountered no incompatibilities, no bugs, no problems, just fast and reliable performance. You shouldn't have problems with the disk packs. As the manual says, don't drop it, put it in your oven or in a bathtub. Neither should you dunk it in nitric acid nor shoot at it. Just treat it like a $100 floppy and you're set. Note: don't write on the disk labels with a pencil. The graphite powder from the pencil is bad news for the drive. I would also recommend not shipping it in a box full of packing pellets without putting it in a protective cover first. The staff at both Carter Graphics and Toad Computers are friendly people who take the time to answer dumb questions. I know, because I called and asked some. Carter Graphics also offers a Syquest disk pack crammed full of Atari ST public-domain programs, pictures and so forth, for $15 over the cost of blank media. That's around 60 double-sided floppies worth of material! This shows concern for the customer. When I identified myself and asked some fairly technical questions, they had no trouble answering them. If I were buying a hard disk now (and I recently did), a Syquest removable disk is what I would get. It's extremely fast, it's portable and it's cost effective; you'd be surprised how fast you can use up the 44MB cartridges. And it provides a means to backup your present hard disks at speeds that mean you'll actually get around to doing it. At $100 for 44MB, this is probably the least expensive media you can store ST files on while still being able to access the data at warp-drive speed. It's as if you suddenly changed to 44MB floppy disks, not 3/4MB floppy disks. START contributing Editor Dave Small is the sire of Spectre 128 and GCR. Doug Wheeler works with Dave at Gadgets by Small. He is also a GEnie Sysop and is widely known for his GDOS expertise. MegaFile 44, Call for Price. Atari Corp., 1996 Borregas, Sunnyvale, CA 94086, (408) 745-2000. ToadFile 44, $899; Syquest Disk Packs, $99; (Call for price and availability of other hard-drive accessories and configurations.) Toad Computers, 558 Baltimore Annapolis Blvd., Severna Park, MD 21146, (301) 544-6943. SQ44-ST, $899; Syquest Disk Packs, $99; Public-Domain Cartridge, 44MB of ST Software, $119. (Call for price and availability of other hard-drive accessories and configurations.) Carter Graphics & Computers, 3006 N. Main Street, Logan, UT 84321, (801) 753-l399 or (801) 752-2500.